There are so many activities for my child, why is music one I should choose? Music is such an important part of our lives whether we are listening in the car, at a party, at a religious service, or even music that celebrates our wonderful country. Music brings meaning, purpuse, and celebration to life. Your child needs to learn through celebrations with music throughout his or her life. You already know she loves it when she dances to everything she hears. You know he loves it when he can’t stop drumming on everything! Music is already in their heads and hearts. In fact while in the womb, your child could hear your heart beat, mom, so listening, dancing, and feeling that beat keeps them connected to their very first sounds! Music is first necessary for the sake of music, enjoying the celebration of life. However, music has been shown, also to help your child learn. 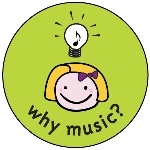 At Music Moments we intentionally teach our classes to allow the concept of the music and movement activity to connect to your child’s brain. In other words, we are helping the brain tune in carefully to all the knowledge that is around it. For example, when we sing the song Wishy, Washy, Whee, we are helping your child learn the “w” song. When we pretend to take a bath with the song, your child understands the purpose and meaning behind the song. So in one song we are teaching a phoneme or a letter sound and relating it to a familiar context. Now, bath time will be so much more exciting when you pretend to be on a big boat in the ocean! Music is for celebration, Music is for the intentional process of learning, and music is for making new friends and connections! Music brings us together. In our Kindermusik classes, we make new friends through sharing, through circle dances like Ring Around the Rosey, and through building a community in our class. In piano, we make new friends when we play a duet with a new student, when we have a group class and learn from each other, and even at recitals! Music is for celebration, Music is for the intentional process of learning, for making new friends, and for learning the subject of music. Music Moments older Kindermusik classes, piano, and voice lessons, focus on music theory and proper technique. We use simple songs and games in Kindermusik to introduce new musical concepts, then we learn how to execute them in piano and voice lessons. It doesn’t have to be perfect, but it is about the learning process and growing gradually stronger through the journey of music. Learning music is a process for a life time! Enjoying music and learning and growing together is what life is all about! You can read more about the research for music education on the following pages! Thank you for choosing Music Moments!